Leading German Jewish group blasts planned auction of Nazi memorabilia, including Hermann Goering's underpants. Germany's top Jewish group Thursday labelled as "disgusting" plans for a weekend auction of Nazi memorabilia, including Hermann Goering's silk underpants. The Central Council of Jews in Germany appealed to the auction house Hermann Historica to cancel the controversial sale of Nazi relics planned for Saturday in the southern city of Munich. The council's president Josef Schuster criticized as "scandalous and disgusting" the idea of "making business, without any limits, with items of Hitler, Goering and Eva Braun." "Such items belong in museums or archives, they should not be sold for profit," Schuster told national news agency DPA. On sale besides Goering's underwear will be X-ray images of the founder of the Gestapo secret police and air force chief. 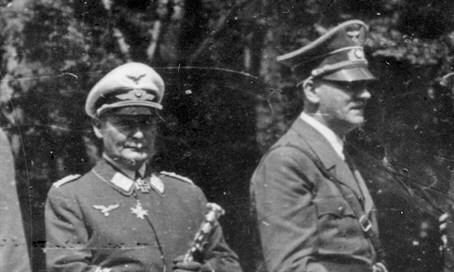 The auction will also offer the brass container that Goering used to kill himself with hydrogen cyanide two hours before his scheduled execution in 1946 in Nuremberg. The Nazis' investigation reports on Hitler's health after the failed assassination attempt on him on July 20, 1944, are another featured item. "Also of historical importance are Hitler's long black trousers whose pockets were leather lined so that he could carry a gun unobtrusively with him," says a statement on the auctioneer's website. The items are due to go on public display Friday under the theme "Hitler and the Nazi grandees - a look into the abyss of evil." They were formerly owned by the late US army medic John K. Lattimer, who was in charge of monitoring the health of Nazi war criminals on trial in Nuremberg. German law prohibits the open display and distribution of Nazi objects, slogans and symbols, but it does not prohibit the purchase or ownership of Nazi objects, for example by researchers and collectors.